Cycle and auto rickshaws are an essential part of the Asian urban transport infrastructure. The modern motorised auto rickshaw has evolved from the old traditional rickshaw propelled by human muscle power; this was later developed into the cycle-powered rickshaw which more recently had a rechargeable battery added to it. Though Kolkata (Calcutta) in India still has many of the traditional man-pulled rickshaws on its streets, in most Asian cities the battery-aided cycle rickshaws largely replaced them. In some places, such as the Old Town section of Dhaka, Bangladesh's capital, the cycle rickshaw is the only vehicle able to navigate its narrow streets. But the 3-wheeler auto rickshaw now dominates many '3rd world' cities, often contributing to the terrible air quality; though some - as in Dhaka and Chittagong - run on 'greener' fuel such as Compressed Natural Gas. Commonly known as "CNGs", they are painted green to signify that the vehicles are eco-friendly. The auto rickshaw drivers, often migrants from poor rural areas, usually rent their vehicles from companies and scrape a living. While the working class will tend to use buses and trams, it's the lower middle classes who predominantly opt for rickshaws, both to commute to work and to send their children to and from private schools. Auto rickshaw drivers can become employed as 'family retainers' for these regular trips. The local municipal state sets the rate per kilometre charged for fares - so regulating the price for transport of labour power as commuters. Employers have an obvious interest in keeping this cost down - an increase will lead to workers' wage demands to compensate for higher cost of living/reproduction expenses. 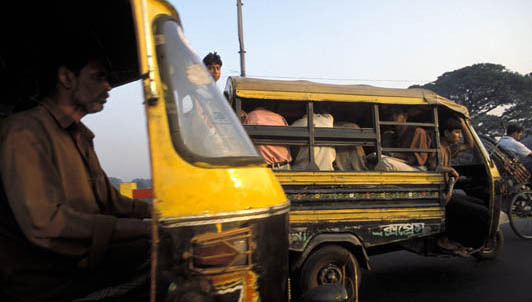 As a key component of transport infrastructure, low income auto rickshaw drivers therefore have considerable economic leverage and potential to disrupt the labour process; leading to a conflict between the overall interest of the ruling class to limit transport costs (or avoid absorbing rises) and transport workers' interests in increasing their income. The auto rickshaw drivers have been in regular dispute with police and local government; they complain that the meter rate set by the municipality is too low to provide adequate income and that they suffer unnecessary police harassment. Yet the police do little to curb the periodic robbery of rickshaw drivers, when they are sometimes killed as their vehicles are stolen. Last week thousands of auto rickshaw drivers in the south-eastern port city of Chittagong began a wildcat strike to press their demands. On Monday (27 Apr) hundreds of drivers fought police, blocked roads with processions, attacked 50 vehicles, including police vans and bikes, and barricaded a busy traffic intersection. They also clashed with the rickshaw vehicle renting companies (who sometimes rip off drivers by refusing to return vehicle hire deposits or overcharging for them) and ransacked the offices of a meter installation company. About 13,000 auto-rickshaws run in the city and the drivers have been defying metropolitan police orders to operate on meter. Police started seizing vehicles and filing cases against the wilful offenders, prompting the auto-rickshaw drivers to call the strike Monday morning. The drivers claim that they lose money if they accept the fares on meters. Deputy commissioner of Chittagong Metropolitan Police Moinul Islam told bdnews24.com that the auto-rickshaw drivers went on strike without any prior intimation to any quarters. "The Chittagong Metropolitan Auto-rickshaw, Auto-tempo and CNG Workers Welfare Union leaders at a press briefing at the Chittagong Press Club, however, said they did not announce any strike officially. The police on Wednesday arrested six leaders of the Chittagong Metropolitan Auto-rickshaw, Auto-tempo and CNG Workers Welfare Union, on charge of torching police vehicles and attacking the police personnel. The arrested were president of the organization, Kamal Uddin, general secretary, Harunur Rashid and executive members Mohammed Solaiman, Golam Mostofa, Bashir and Motaleb. According to one of the arrested; "Kamal Uddin claimed that they had actually no programme for observing any strike. “We were supposed to hold a rally in front of the Press Club, but a section of drivers turned violent to foil our peaceful programme,” he said." Over 30 people have since been arrested in connection with the strike and police are using CCTV to trace others involved in the protests and property destruction. There have been no further news reports on the strike since the arrests, perhaps due to a state-ordered blackout designed to help pressure an end to the strike. Who can ride the garment tiger? another great contribution man. Cheers! Yeah, this is really interesting. Out of interest are you bengali? Or if not where do you get this stuff.